Now widely sold in the United States as Chrysler group’s own captive import under the name Dodge Colt, the Lancer receives its first major face-lift, that includes a new grille without fog lights, turn signals moved to the bumper, and large rectangular taillights replacing the L-shaped units used previously. The steering wheel can now be tilted to better fit any driver. Simultaneously, the trim arrangement of the Lancer range is modified. 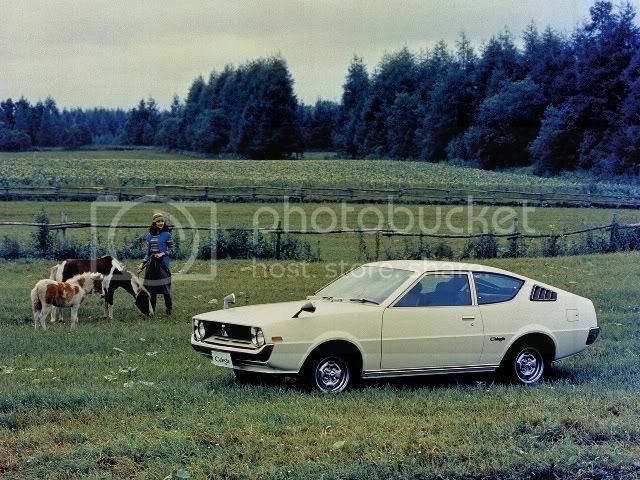 During spring 1977, the base 1.2-litre “Saturn” engine is replaced by a new “Orion” block of similar displacement, answering the yet stricter emission rules that the Japanese authorities are setting up. The Saturn remains the only available 1200cc engine for Lancer estates, though. In June, that is the turn of the “Saturn” 1.4-litre engine to be updated to “MCA-Jet” standards. A new “Populaire” trim is the Lancer’s cheapest offer, topped by the “GL” and an “SL-5” offering a five-speed gearbox. ● Introduction: January 1973. Construction: unibody. Engine: water-cooled inline four, 1.2-litre, 73 hp (70 hp from April 1977), mounted at the front. On “Van” estates: inline four, 1.2-litre, 80 hp standard. Transmission: to the rear wheels through a four-speed manual gearbox. Five-speed manual gearbox optional. Suspension: independent at the front, rigid axle at the rear. Brakes: hydraulic, to discs on front wheels, drums on rear wheels. Length: 400 cm. Top speed: n/a. Range: two-door saloon, four-door saloon, four-door “Van” estate. The Lancer 1400 is available in two different trims: “GL” (four-speed manual transmission standard, but automatic optional), and “SL-5” (five-speed manual transmission exclusively). ● Introduction: January 1973. Construction: unibody. Engine: water-cooled inline four, 1.4-litre, 85 hp (82 hp from June 1977), mounted at the front. On “Van” estates: inline four, 1.4-litre, 92 hp standard. Transmission: to the rear wheels through a four-speed manual gearbox. Five-speed manual and three-speed automatic gearboxes optional. Suspension: independent at the front, rigid axle at the rear. Brakes: hydraulic, to discs on front wheels, drums on rear wheels. Length: 400 cm. Top speed: n/a. Range: two-door saloon, four-door saloon, four-door “Van” estate. The “1600 GSL” is the performance version of the Lancer, fitted with a powerful 1.6-litre “Saturn engine”. ● Introduction: January 1973. Construction: unibody. Engine: water-cooled inline four, 1.6-litre, 92 hp (86 hp from June 1977), mounted at the front. Transmission: to the rear wheels through a five-speed manual gearbox. Suspension: independent at the front, rigid axle at the rear. Brakes: hydraulic, to discs on front wheels, drums on rear wheels. Length: 400 cm. Top speed: n/a. Range: two-door saloon, four-door saloon. The GSR is the street version of the car Mitsubishi’s works team enters in selected events of the World’s Rally Championship. ● Introduction: January 1973. Construction: unibody. Engine: water-cooled inline four, 1.6-litre, 100 hp, mounted at the front. Transmission: to the rear wheels through a five-speed manual gearbox. Suspension: independent at the front, rigid axle at the rear. Brakes: hydraulic, to discs on front wheels, drums on rear wheels. Length: 400 cm. Top speed: n/a. Range: two-door saloon. 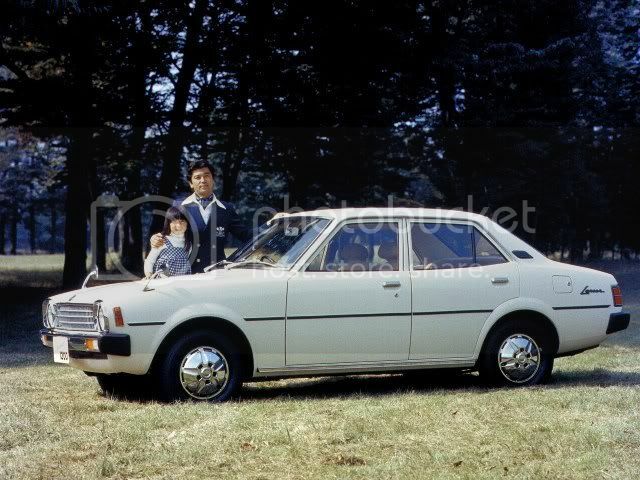 Using the platform and mechanical parts of its Lancer, Mitsubishi has devised this elegant coupe. For 1977, all Celestes receive a vertical badge that divides the front grille in two halves. ● Introduction: February 1975. Construction: unibody. Engine: water-cooled inline four, 1.4-litre, 85 hp, mounted at the front. Transmission: to the rear wheels through a four-speed manual gearbox. Five-speed manual gearbox optional. Suspension: independent at the front, rigid axle at the rear. Brakes: hydraulic, to discs on front wheels, drums on rear wheels. Length: 412 cm. Top speed: n/a. Range: two-door hatchback coupe. A new Celeste 1600 GT is added to the range this year. ● Introduction: February 1975. Construction: unibody. Engine: water-cooled inline four, 1.6-litre, 92 hp, mounted at the front. Transmission: to the rear wheels through a four-speed manual gearbox. Five-speed manual gearbox optional. Suspension: independent at the front, rigid axle at the rear. Brakes: hydraulic, to discs on front wheels, drums on rear wheels. Length: 412 cm. Top speed: n/a. Range: two-door hatchback coupe. ● Introduction: February 1975. Construction: unibody. Engine: water-cooled inline four, 1.6-litre, 100 hp, mounted at the front. Transmission: to the rear wheels through a five-speed manual gearbox. Suspension: independent at the front, rigid axle at the rear. Brakes: hydraulic, to discs on front wheels, drums on rear wheels. Length: 412 cm. Top speed: n/a. Range: two-door hatchback coupe.